Beth Luey - editor, author, lecturer, and former owner of her own small publishing company - explains how to choose a publisher and how to present a persuasive and well-planned proposal. Written in a conversational style that is interesting to read, her book introduces the reader to the standard publishing contract and offers advice on how to negotiate. She gives clear, common-sense guidance on preparing the final manuscript, applying for permission to quote, and producing suitable artwork. This new edition contains an entirely new chapter on writing nonfiction for a general audience and has been revised and updated throughout to reflect the state of new technologies and their meaning to authors. 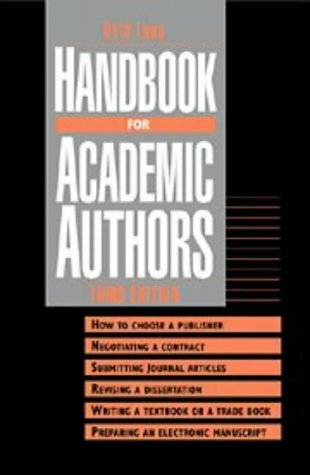 The author also gives advice on revising the dissertation for publication; writing and submitting journal articles; and planning, writing, and publishing the scholarly book. A concluding chapter on prices and costs will help authors understand the business of publishing.